The indoor music best prize is won in Teru ell Academy of Music in 1999. [Konserubatorio] (Academy of Music) Barcelona municipal accordion department graduation in 2003. Accordion charge of La Tuna de Japon ([ra] [tou;na] [de] [hapon]) that performs traditional music of Spain. The accompaniment (Pascal Venturelli, Drop, and Nello Angellucci, etc.) 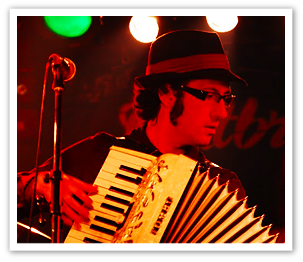 with the accordion main Cast of the NHK Educational television in 2007 and the Spanish conversation (2009 year is broadcast again) It is acting by NHK international broadcasting Tokyo eye in Latin rock band mother's milk sake formation (bonyushu.com) Tokyo in 2009 the reporter.